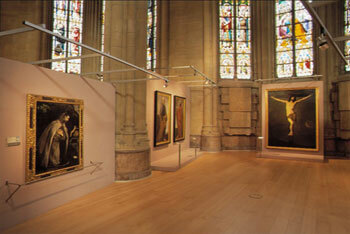 This museum is housed in the ambulatory of the Cathedral of St Mary Immaculate or “New Cathedral”, a building constructed in the 20th-century in the neo-Gothic style. It contains a selection of the religious treasures of the city, dating from the pre-Romanesque to the Baroque. The rooms are arranged chronologically and according to the materials and supports used to create these works of art: stone, wood, panels, canvas and silver. The paintings of Ribera, Luca Giordano and El Greco can be found alongside Gothic altars and Spanish-Flemish altarpieces.